The Spectrem Household Outlook, designed to measure an investor’s optimism about four financial components in their daily lives, noted a significant decrease in the Outlook for the Economy of non-Millionaires. That drop created an overall decrease in the Outlook for the month of June. While the overall Outlook number came to 24.60, a drop of just over 1 point from May, the decrease in the Economy rating among non-Millionaires was from 24.10 to -0.90, the first time that rating has been in negative territory since June of 2017. Non-Millionaires reported a decrease in their rating in all four categories: Household Income, Household Assets, Company Health and Economy. At the same time, Millionaires reported a better Outlook in June than in May, especially in Company Health, where the rating went from 13.77 to 25.90. The overall Outlook among Millionaires rose to 30.04, the best rating since March. Something about the Economy is bothering non-Millionaires, as their rating of -0.90 marked the first negative rating for any category since June of last year. Overall, the rating for the Economy has taken a nosedive in two months, from the record-breaking level of 43.60 in January down to 10.80 in June. Among Millionaires, the rating for the Economy actually rose slightly to 20.14. The drop in the rating for the Economy was driven by retired investors (from 29.84 to 13.46) and female investors (from 9.47 to -12.82). The minor increase in the Household Assets number is a second month of recovery for this category, which in April reported the lowest number in 18 months. Still, the improvement comes from a slight increase among Millionaires; non-Millionaires again reported a drop in their Outlook for Household Assets to 42.24, a second month of decrease. The Household Asset rating among working investors fell to 52.80, their lowest mark of 2018. Male investors also reported a drop in their Outlook for Household Assets. The overall rating for Household Income increased slightly in June, but still has gone from 29.90 in February to 18.80 in June. As with the other Outlook categories, Millionaires increased their Outlook on Household Income while non-Millionaires decreased theirs, and their percentage changes were nearly identical. Among working investors, the Outlook for Household Income dropped, while Retired investors reported an increase for the first time in three months. Female investors also reported a significant jump in Household Income to 20.51, the highest level since February. For male investors, the Outlook for Household Income actually recorded its fourth consecutive month of decreases. In February, the Outlook for Household Income among males was at 32.10, and now it is down to 18.02. 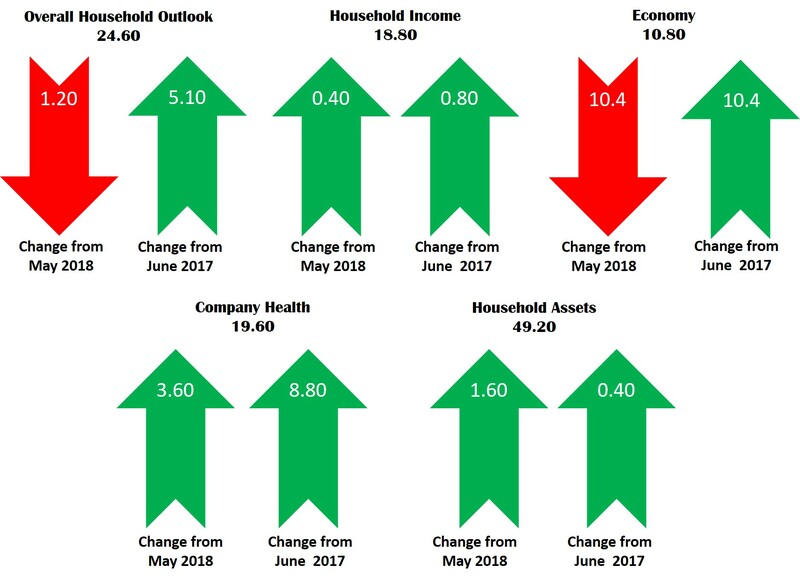 A second month of improved Outlook over Company Health came in June thanks to a big boost from Millionaires, who raised their Outlook over Company Health from 13.77 to 25.90, their highest level of the year. For comparison's sake, the Outlook for Company Health among Millionaires in April was 5.43. At the same time, the Outlook for Company Health among non-Millionaires fell to 11.71, the lowest level among non-Millionaires in 2018. Company Health Outlook rose for both male and female investors, and for females, the rating went from 12.63 to 19.23, the highest level for women since January. Both Republican and Democratic investors reported an improved Outlook for Company Health in June.